Jeff Rockwell is a veteran fighter, competitor, trainer, and coach, with over 17 years of experience in the martial arts. He has trained under such legends as Ricardo De La Riva, Erik Paulson, Marcelo Garcia, Pedro Sauer, and Burton Richardson, as well as with countless other BJJ black belts, NCAA wrestlers, and MMA fighters. Prior to moving to Austin, TX, Jeff was the Head Brazilian Jiu-jitsu and MMA Coach at LionHeart MMA in State College, PA, training up-and-coming UFC and StrikeForce standouts such as Phil Davis, Jim Hettes, and Paul Bradley. Jeff also founded Raptor Brazilian Jiu-jitsu in State College, the only affiliate school in Pennsylvania under jiu-jitsu legend Professor Ricardo De La Riva. In addition, Jeff served as the head Brazilian Jiu-jitsu instructor at the Oregon Pound Brazilian Jiu-jitsu Academy in Corvallis, Oregon, and taught both BJJ and MMA at One Spirit Martial Arts in Herndon, Virginia. Jeff has been very successful in both amateur and professional grappling competitions on the East and West Coasts of the US; he has also fought in full contact kickboxing and Mixed Martial Arts events. Jeff was promoted to black belt in Brazilian Jiu-jitsu by Antonio Passos in April of 2010, and continues to seek out high level fighters and grapplers to increase his knowledge and abilities. Jeff believes in leading from the front, and when he is not in the corner of his fighters and students, he is still actively competing in BJJ and grappling competitions to test his technique under fire and continuously improve. Jeff also serves as the head instructor for the University of Texas BJJ Club. •Second Place, Men's Brown/Black Division, 160-180lbs. • First place, Men’s Brown Belt Division 170lbs. • First place, Men’s Purple Belt Division 175lbs. • Third Place, Men’s Advanced No-Gi 175lbs. • First place, Men’s Purple Belt division 169lbs. • First place, Men’s Advanced No-Gi 169lbs. • First place, Advanced 175lbs. Mike Harmon started learning BJJ at age 14, from innovative BJJ Black Belt instructor and multiple Pan American Gold medalist, David Ginsberg, and has been his student ever since. In addition to his primary coach, David Ginsberg, Mike has trained with some of the other leaders in the sport, including Jean Jacques Machado, Gordo, Gordinho, Marcio Feitosa, Eddie Bravo, and time spent with Brazilian Top Team and Team Renzo Gracie. Mike also serves an an instructor at the University of Texas BJJ Club. 8/2012 IBJJF BOSTON OPEN, Boston, MA. 3rd place, Brown belt, Featherweight. 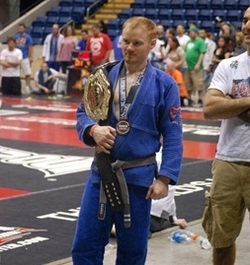 6/2012 - NAGA HARFTORD, Hartford, CT.
2nd place, Brown/Black belt, Featherweight. 2nd place, No-gi Expert, Featherweight. 5/2012 - IBJJF DALLAS OPEN, Dallas, TX. 11/2011 - NABJJF Lone Star State Championships, Dallas, TX. 10/2011 - IBJJF No-Gi Pan American Games, NY, NY. 3rd place, Brown belt, Lightweight. 6/2011 - NAGA New England, Springfield, MA. 1st place, No-gi Expert, Featherweight. 3rd place, Brown/Black belt, Featherweight. 6/2009 - NAGA East Coast Championships, Fall River, MA. 2nd place, Brown/Black belt, Middleweight. 6/2008 - NAGA New England, Fall River, MA. 1st place, No-gi Expert, Lightweight. 5/2008 - MASSBJJF Massachusetts State Championships, Boston, MA. 2nd place, Purple belt, Middleweight. 8/2001 - JBA Submission Challange. Fall River, MA. 1st place, No-gi, teen division. Sam began his BJJ training in 2007 under Phil Cardella/ Relson Gracie. He then started his wrestling training a year later in 2008 under Jason Carr. Sam has been fortunate to have learned from great jiu jitsu artists like Royler Gracie, Robert Drysdale, Xande Ribeiro, Relson Gracie, and others. Sam now trains exclusively under Jeff Rockwell. He has competed in several tournaments, and looks forward to continue competing. Sam was awarded his purple belt in 2010, and his first stripe in 2012.